The Book of Mormon is a fraud you say? Joseph Made it up or stole the ideas from someone else? If only it were that simple. Today I sit down with two friends, Chris and Clay. 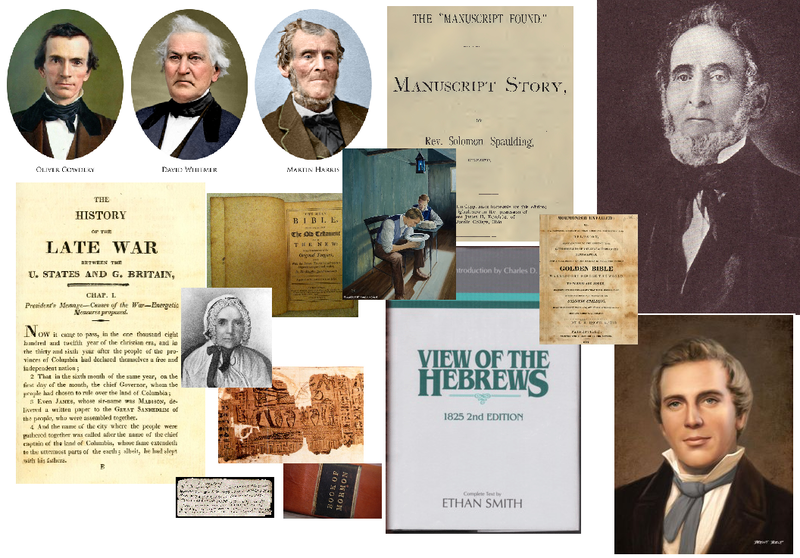 We talk about ways in which to corroborate a fraudulent narrative of the Book of Mormon. Who could have been involved and how the narrative would have to flow based on who is in on it and who is being duped along with what it should look like if Joseph is truly plagiarizing sources to create a fictional work. Is “The Book of Mormon” a fake? Maybe… that conclusion certainly is reasonable. Yet, as we explore in today’s episode, to create a coherent historical narrative that explains the ins and outs of how such a hoax could be pulled off seems to have just as many issues if not more than simply believing in the divine nature of the book. The witnesses, Emma, Rigdon, Spaulding, View of the Hebrews, Late War, Savant, Genius, Photographic memory, and everything in between is explored in just over an hour…….. Is there room for faith?…… the choice was always yours! Great podcast! Thanks for the great insights. I was wondering: The historical record of witnesses to his translating doesn’t say JS ever used other documents for reference. Emma explicitly said he didn’t (at least when she was present). But, we don’t have statements from EVERY scribe saying that JS NEVER used other materials. Therefore, I don’t see any reason that JS couldn’t have been inspired by what he was seeing in the seer stone to pull out his King James bible and copy down verses and chapters as he felt impressed to do. That seems more plausible than him getting King James errors through the revelatory process using the seer stone. Thoughts? I have listened to your podcast for several months now but this is my first time commenting. Although I am not a believer I enjoy your nuanced perspective because it helps me stay more fair and balanced in my own thinking. However, I must say that I was a little disappointed by what I perceive as a lack of your typical nuance in this episode. From the beginning all three of you assumed that the BOM is either an actual ancient text that Joseph produced by revelation or a complete fraud. Isn’t it possible that the book could be a 19th century production without being a knowing fraud? I believe that Joseph and the witnesses all truly believed it was what they said it was. If this is the case then of course none of them would recant their testimony of the BOM. Just a possibility that I thought could be explored. Also, I felt that the discussion about plagiarism was too black and white. The one book we do know Joseph knew well was the Bible. He doesn’t necessarily need to have read the other books that have been suggested in order to use ideas from them–the question of Native American origins, for example, was a hot topic of conversation and he wouldn’t need to read View of the Hebrews to know that. There is no doubt that the BOM is a remarkable work, and I certainly can’t explain every aspect of the work, nor do I feel the need to do. Joseph was clearly a fantastic storyteller and a creative mind (not necessarily a genius in the traditional sense). You made the comment that Joseph didn’t plagiarize the books of Moses and Abraham. In one sense I agree–his main source was the Bible, but he creatively reinterpreted it much as the writers of the ancient apocryphal books did. In reading 1 Enoch or Jubilees I can see how creative biblical exegesis works. I see common elements of this in the BOM (such as exegesis of the Adam and Eve story in 2 Ne. 2 and Alma 42), Moses, Abraham, and parts of the D&C. Not a smoking gun, of course, but something worth considering. Anyway, I don’the mean this as a critique of you, just suggestions of things to take into account. Keep up the great work. I appreciate your comments. In order to jump into the nuance on this large a range of topics one would need to take up hours or make it several episodes. Our goal was to show that while the BOM has problematic issues there is reason for those who want to believe to maintain faith. That is always my goal. For sure, I understand that that is your goal and I think it is a good one for a certain segment of people. I guess my main point is that if you want to offer listeners a way to believe while acknowledging difficulties, it might be nice to provide a middle way option (for example, that God revealed to Joseph the essential doctrines but allowed Joseph to couch those teachings in a narrative of his own choosing–or something like that). Perhaps if you would have had more time you would have done just that. You have done an excellent job providing other middle way options on other subjects, and I think that is an important service for people who cannot believe literally but want to remain connected with the the faith. I struggled with this episode because it scratches on the surface of issues that I believe you know are much more complex and controversial. Good critical analysis around the BoM has been done that dives much deeper on challenging issues about authorship, try “New Approaches to the Book of Mormon”, “American Apocrypha: Essays on the Book of Mormon”, “Indian Origins and the Book of Mormon”. Also on the witnesses Dan Vogel has done good work bringing serious questions to the table. There is just so much more that you didn’t address and in some cases that you seemed to gloss over, I was disappointed by this. Bill, one of your strong points and reason’s I’ve been a fan of yours is that you typically try to validate the questioner as having legitimate questions. When you do this, I think you are at your strongest, because you don’t try and dismiss the critical arguments that are vexing the questioner, and you end with saying that there aren’t any easy answers to these difficult questions. Yet in this podcast you seemed to take a different stance where you are trying to equivocate the positive evidence along side the negative. When you do this, I think you’re less effective in my opinion, and I don’t find this approach helpful. Although I’m not a fan of some of your nuanced views. I think your audience would find the archeological evidence for the Book of Mormon found in North America very interesting. In the North American model most people hold the Hopewell Indians as the Nephites and the Adena as the Jaredites. The Hopewell have a timeline beginning with the first civilization around 500BC and their civilization ended at around 400BC excellent matches for the timeline. The Hopewell and Adena have confirmed metal breastplates and head plates metal weapons and jewelry. The Hopewell made their own clothing from fine twine linen. Hopewell Indian fortifications are also a match as described in the Book of Mormon. There is historical evidence by 19th century Smithsonian researchers and early settlers that Hopewell Indians not only smelted iron but made swords as found in Hopewell Indian mounds. It also helps that Hopewell lands also include areas such as New York state where the Hill Cumorah is. First of all I want to say that I appreciate all the effort you put into trying to help people. But I actually came here to echo the sentiments that J expressed in his comment. As much as I can understand that you want to come at things from a faithful perspective, I found this episode really weak intellectually. When one of you says “don’t even bring Emma into this because I really like her” and then you guys just move on without any further discussion I have a really hard time feeling like you really examined things thoroughly. I get that to dig into this properly would take many more hours of discussion than what you had here but in my opinion it would be better to not do it at all than to do it half way. My main criticism I suppose is that this is three guys who all share the same view agreeing with each other for an hour. Where is the opposing viewpoint? Wouldn’t a discussion between yourself arguing the faithful perspective with an informed sceptic be a more meaningful conversation? I guess I just found the echo in this particular chamber too loud for my liking. All that said, I do appreciate your perspective. Thanks again for the hard work. I hear you. I understand your criticism. I am sorry this episode wasn’t beneficial to you and hope I continue to bring content that is helpful. The issue with Emma is that we spent a lot of time early with the first two people and Chris was looking to keep us moving. Perhaps we are asking the wrong questions. Perhaps instead of asking whether or not the Book of Mormon is divinely inspired maybe instead we should be asking what is the divine. What is God? Why would he inspired one man to write the Book of Mormon, another man to write the Quran, another to write the Tao Te Ching, another to write the Bhagavad Gita? etc. etc. Why would he lead one man into Mormonism and another one into Islam? or Buddhism? Adventism? or Judaism? etc. etc. and give them a powerful witness and spiritual confirmation that their particular religion is true. Clearly Mormonism has brought about tremendous changes for the good in some people’s lives and brought them closer to Christ. Others it has harmed. Mormonism is just one facet in the diamond that we call God. Who can understand it? It’s a mystery, a beautiful mystery. It’s just our egos that want to make ours the only path and everyone else’s the devil. I believe real spiritual maturity is accepting and allowing everyone their own spiritual journey without judging it and seeing it as part of the beautiful mystery that we call God. I think there were many many possible views not explored. The attitude seemed to be that Joseph’s only options was to plagiarize because the text is so complex and comes together so well. Well SOMEONE wrote it! 😉 Whether it was ancient people, or Joseph Smith, or some other contemporary of Joseph. 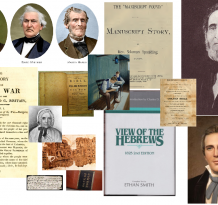 The text doesn’t purport to be written by God’s hand–so that leaves us with mere mortals putting together the thoughts, stories, and theology and writing them into what became the BoM. It is a decent feat regardless of who wrote it. But there are many gifted writers or story tellers throughout time. Joseph Smith may have been one such person. Or a contemporary of his. Or an ancient. But someone did write it, and in my mind that opens up the possibility that if someone wrote it, then there are a number of people capable of writing such a work. It would take someone with a passion–maybe even an obsession with Christian theology. With lots of creative story telling ability. And someone with a disregard for convention. There aren’t a lot of people that fit that bill, but there are some. One thing a lot of you are missing out on is the historical record. The Book of Mormon matches the Hopewell Indians in significant ways. The artifacts the timeline and dna matches to the Book of Mormon. North American Indians have dna from Israel and the middle east. Plagiarism would not allow to get these historical accounts correct. To say that Joseph Smith wrote this is a bad way to put it saying he translated the Book of Mormon is much better. Native Americans believed they killed off a white race of Indian and also had white ancestors. Native Americans built lavish temples. “Their temples were built with much skill and labor. They made very beautiful things with all kinds of materials, such as gold, silver, stones, wood, fabrics, feathers, and many other things in which they made their skill appear. They also had interesting temple ceremonies. The Native American ceremony of Red Hand is very interesting. The tribes that conducted this ceremony in their long houses are the Iroquois, that being the Seneca, Cayuga, Onondaga, Oneida, or Mohawk. Keep in mind Red Hand is a Native American ceremony, nothing else. The account has been edited for relevance. The proceedings began with 4 raps at the door. The candidate was brought in and listened to the story of Red Hand, the ancient leader. The candidate assumes the identity of the object of the story. Red Hand was a young Chief who received certain mysterious knowledge from the Creator of All. He was kind, generous, and loved by all. When studying the Natchez temples many of the same implements found in Hebrew temples was also present in the Natchez temple. In Hebrew temples, you have a rectangular shaped building with high walls, all constructed and furnished with great craftsmanship and lavishness. Inside you have the menorah, an eternal light (oil lamp), a veil, and the Ark of the Covenant. The Natchez have many similarities. They have an eternal fire that it is held with such regard that if it goes out those responsible for it are put to death. They have an alter inside their temple. They have a curtain or veil. Behind the veil is a wicker basket that no one is allowed to open. Here are some very ties to the Book of Mormon that native Americans have. This has bits and pieces of the account of the Lamanite daughters. The Cherokee have a myth listed below, which I find ties to the Lamanite daughters who would go out to Shemlon to dance and make merry, but are abducted by the priests of Noah and become their spouses. The Lamanites try to find the daughters and blame the Nephites for their disappearance, which causes a war. This war continues until the Lamanites are told that the Nephites did not abduct the girls. The daughters stop the priests from being killed when they are found out. “Allured by the haunting sound and diamond sparkle of a mountain stream, she wandered far up into a solitary glen. The dream picture of a fairyland was presently broken by the soft touch of a strange hand. The spirit of her dream occupied a place at her side, and, wooing, won her for his bride. The Book of Mormon tells the history of the Anti-Nephi’s, a Lamanite people who no longer wanted to fight or kill other people. They made this covenant to God to longer fight by burying their weapons in the ground, never to use them again even in the case of self-defense for themselves or for their family. The saying bury the hatchet comes from the Algonquin Indians of the Great Lakes area who also made peace by burying their weapons of war. As mentioned before, I think the Hopewell Indians are the best candidate to be the Nephites for numerous reasons – this is one of them. The first mention of the practice in English is to an actual hatchet-burying ceremony. Native American idioms and phraseology, as described by early settlers, are consistent with the Old Testament and the Book of Mormon. Below are some examples of Native American idioms consistent with scripture. Examples are from John Heckewelder’s Manners and Customs of The Indian Nations Who Once Inhabited Pennsylvania and the Neighboring States. Meaning: I will protect you at all hazards! You shall be perfectly safe, nobody shall molest you! Scripture: 3 Nephi 10:6 O ye house of Israel whom I have spared, how oft will I gather you as a hen gathereth her chickens under her wings, if ye will repent and return unto me with full purpose of heart. Meaning: To consign it to oblivion. Scripture: 2 Nephi 26:5 And they that kill the prophets, and the saints, the depths of the earth shall swallow them up, saith the Lord of Hosts; and mountains shall cover them. Meaning: You endeavor to deceive me; you do not intend to do as you say! Scripture: 2 Nephi 27:25 Forasmuch as this people draw near unto me with their mouth, and with their lips do honor me, but have removed their hearts far from me, and their fear towards me is taught by the precepts of men. Meaning: I make you feel comfortable after your fatiguing journey, that you may enjoy yourself while with us. Hebrew Custom: The washing of feet is a Hebrew custom. It was the first item done when entering a house or tent. The host would provide the water and the guest would wash his own feet. If the host was wealthy, a slave would wash the feet. Anointing of oil was used by Jews to refresh and invigorate the body. This custom is still done today by Arabians. In the example there are some similarities in the cleaning of feet and legs from thorns and the anointing of oil or grease to refresh the body. Bone pits found in New York and surrounding areas. At the final battles at the Hill Cumorah, nearly a quarter of a million Nephites were slaughtered. An untold number of Lamanites were also killed. Indian legend supports this great and terrible battle that caused the death of hundreds of thousands of people. In the last battles Mormon states that bodies of the Nephites were heaped into piles (Mormon 2:15). Once again the Geography of the BoM switches around conveniently from the Large one to the Small one. There is no question that the BoM is a great book. The lessons in human relationships [good or bad in 21st century perspective] are still valid. But if as the Church essay states the ol’ Lamanites were here by themselves there is not enough time in isolation to have lost immunity to Euro-Asian diseases to which the original Nephites were immune, since they had Euro-Asian beasts and pets with them. MesoaAmerica as well as the North East could have used some of that immunity when the white settlers showed up. Currently no work that I’m aware of has been written in the relationship of the Thule people and the Norse from 900 CE to 1300 CE as far as disease. Either small or large geography notwithstanding Native people died in large numbers due to Euro-Asian diseases brought about by exposure to White Settlers and their cattle and pets. The BoM is still a great book but for the philosophy and human story that it tells………not the accuracy of the story. Unless of course North East Native people are different somewhat to the more usual suspects of Pueblo, Plains and Mesoaamerican natives. Here is one more food for thought. Although its confirmed by archeologist that prehistoric native Americans made metal breastplates and head plates. It has not been confirmed the use of smelting iron or the making of swords but early settlers did find iron swords in Hopewell and Adena mounds. I don’t mean to plaster your comment section with Book of Mormon evidence but here is one more section. Prehistoric native Americans made metal plates that is confirmed. Native Americans have traditional account of burying and using metal plates for historical records. Bill as a Fan of your Podcasts, I would agree this one was done way too hastily, and needs to be be revisited. Would that be possible? Dig in way deeper and not just move on to next, next, next. so quickly. David, I hear you but as of present I don’t have plans to split this up into multiple episodes and dive deeply. I do agree though there is plenty here to do that. The New Madrid fault lies along the Mississippi river and has earthquakes that match the earthquake mentioned in the Book of Mormon that preceded Christ’s visit to America. It’s also worth noting that, as described in D&C 125:3, Zarahemla is along the Mississippi river, in the earthquake zone of the New Madrid Fault. The Book of Mormon describes areas of land that sank and lands that lifted and shaking that lasted for long periods of time. It also describes a vapor of darkness to the point that they could not light fires. Now compare eyewitness accounts of a New Madrid quake that happened in 1811. Quotes come from Joseph Knew website. Kentucky is a proposed North American Nephite land that saw so much blood and carnage that, after the Nephites were removed, the Cherokee and Sack Tribes refused to enter those lands. The Book of Mormon states that the Nephites dumped thousands of bodies of Lamanites slain into the River Sidon, which is likely the Mississippi River which borders Kentucky. In the Book of Mormon it states that Lehi and his family sailed from the Middle East to another country. Some North American Indian tribes have a belief that they arrived to the North American continent through sailing from another country. The Gaspesian/Micmac have two theories of how they arrived. The first is by sailing from another country, and the other belief fits the Genesis account and flood. Iroquois legend of a foreign people who sailed to the continent then were destroyed. Cusick’s book I believe is about the Nephite and Lamanite Interactions and fighting except from the Lamanite perspective told in Iroquois Legend. A second account of Christ visit to America. Book of Mormon states that Jesus Christ after his resurrection visited the American Indians after great natural disasters among the Nephites. Christ taught the people the gospel, he showed them the imprints in his hand, ordained disciples and performed miracles among the people. There are some Indian legends that support this visit. Mic Mak Indians the tribe that most resembles the Nephites. Father Chretian Le Clercq a Roman Catholic missionary lived among the Micmac Indians for twelve years. After spending this time with the Micmac, he then sailed back to France and wrote a book about the customs and religion of the Micmac Indians. He helped the Micmac Indians develop a written language composed of Hieroglyphs. He most likely used the characters that the Micmac Indians were already familiar with. If Clercq himself had developed the written language he most likely would have used the Latin alphabet – the language he grew up reading and writing with. Four Micmac characters are similar to Egyptian Hieroglyphs in appearance and meaning. Other Micmac characters are similar to characters found on the Anthon Transcript. There are examples of Hebrew customs, characters, beliefs and language among Native Americans. According to Mormon, they knew how to write in Hebrew and of course had Hebrew customs and beliefs (Mormon 9:33). The Greek language is also compared to the Native American languages of the Indians. Archeantus – Nephite commander (Moroni 9:2); a typical Greek formation, made using the Greek prefix ‘arch-‘ (“great, chief”), as in the Biblical Greek names Archelaus and Archippus. Judea – the name of a Nephite city (Alma 56, 57); it is the Greek (i.e., New Testament) form of the Hebrew name ‘Judah,’ referring to the tribe, the Southern Kingdom, and the area of southern Palestine occupied by the tribe of Judah (the Jews). Mormon 9:33 – And if our plates had been sufficiently large we should have written in Hebrew; but the Hebrew hath been altered by us also; and if we could have written in Hebrew, behold, ye would have had no imperfection in our record. I believe that haplogroup x or the Nephites brought over a distinct language and culture. There is evidence that the Great Lake Indians have a unique and different language separate from surrounding tribes. Wars mentioned in the Book of Mormon were fought primarily between the first and fourth months mentioned in the Book of Mormon. During Nephite and Lamanite battles the Lamanites are described as wearing loin cloths. If the Nephite and Lamanite in the area between the Great Lakes and the Gulf of Mexico not going beyond the Rocky Mountains. How could the Lamanites wear loin cloths in the middle of winter when temperatures can drop below freezing? In the Hebrew calendar the first month is between March and April. This would mean that the Majority of wars were fought between spring and summer. Wearing loin cloths would not be a problem. But I know of one occasion mentioned in the Book of Mormon that a battle was fought during the winter and luckily it gives us a description of what the Lamanites were wearing Alma 49:6 “very thick garments to cover their nakedness”. The Lamanites known to wear loin clothes prepared themselves for battle with armor and thick garments. In this example there is obviously no conflict because of the wearing of thick garments. Joseph Smith easily could have used the current Roman calendar to use for the Book of Mormon if it is a work of fiction. John Sorenson who is a famous Mesoamerican Archeologist espousing the Mesoamerican Book of Mormon geography model. He wrote the Mormon Codex considered the bible of the Mesoamerican Geography model. He at one time had the Nephites using a calendar similar to the Roman calendar. The one problem with this is that it would mean that Christ was crucified in January instead of April. If the Hebrew calendar is used this is not an issue. Other verses that show that the Book of Mormon had seasons fitting the Heartland model are descriptions of migrating beast that migrated based on the season (Mosiah 18:4). Mesoamerica does not have migrating land mammals. James Adair wrote that the Cherokee Indians keep manner of time same as the Hebrews. While doing research I have noticed the same similarities with the Natchez of Mississippi. The Natchez have 13 months in their calendar but that might be to account for the fact that the cycle of the Moon is longer than 365 days. The cycle of the moon is 375 days. The Natchez also break up the day in the same way as the Hebrews. There is also a good candidate for the waters of Mormon found in Missouri. Based on the geography and features of the suggested place and the description given by the Book of Mormon and D&C. What sticks out is it is described as a fountain of pure water. Big Springs, Missouri fits this description. Big Springs is a single spring that has a daily out flow of 286 million gallons per day. Enough that the springs creates white water as it enters what appears to be glacial crystal clear pool of water. You can see the white water that is produced from the out flow of the spring. The pool of water is surrounded by a thicket of trees. How do we know that the waters of Mormon should be in Missouri the Book of Mormon and Doctrine and Covenants helps answer that question? So from these verses we learn that the Waters of Mormon are near the border of the land. So how do we learn where the borders of the land are located that is deduced from D&C 54:8 when missionaries were sent out to Missouri. Missouri is stated as the borders of the Lamanite lands. The borders of the Lamanites is located in Missouri just like the Waters of Mormon would be located in Missouri. Its large outflow of water could easily be described as a fountain in its simplest terms. Hey Bill, would you update the tags on this episode to include your friends Chris and Clay, and give us their last names? You said you had them on before and I was interested to link back to the earlier episodes. Thanks! This one is a little ridiculous. It made a complete strawman of the real issues and then took turns on the pet construct like a pinata. How about maybe they lied? Oliver and Sydney’s descriptions are what the mockery of doubts on the BoM narrative are being based on for this podcast- but we all agree they lied on the record several times. How about they didn’t recant their testimonies because it would be self-incriminating and ruin their livelihoods that depended entirely on people trusting their word and testimonies (as a lawyer and a religious leader)? 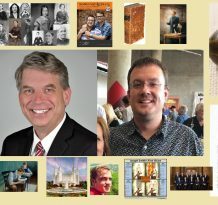 The way Mormons and the law got along, I can’t imagine admitting your published testimony in the Book of Mormon was fraudulent would be in their best interest. Of course if you believe the only possibility here is that Oliver and Sydney are completely trustworthy ONLY when it comes to the BoM, it becomes easy to make doubts of how they described the process look stupid. I don’t think it’s unreasonable, and certainly not stupid, to not trust what they said about anything. Sorry, VERY helpful podcast most of the time but this was frustrating not being able to respond or ask anything back. I hear you and the consensus was very split on this one. It was one you either loved or hated. Bill, There ARE sources for The Book of Abrahram — several different books that Joseph is known to have. Mormonthink lists them. and Joseph was TOTALLY faking it when he asked Emma if there were walls around Jerusalem. Of course he knew there were walls. Emma was not “in” on the scam. Joseph Smith Sr. was a school teacher. Joseph Smith was not uneducated; he was homeschooled.